In the famed hot spring of Yumura Onsen, stands the Kofu Fujiya Hotel, a 15 story-built status hotel that is representative of the city of Kofu, capital of Yamanashi. 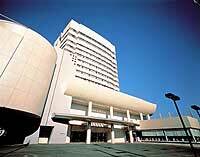 The hotel provides a harmonized atmosphere of urban refinement and resort relaxation. Yumura Onsen is a very old hot spring resort in Kofu City and Yanagiya is located in the middle of Yumura Onsen founded one hundred years ago. It is Japanese style two-story white building among the trees and has a large garden and hot spring baths.